Stylish first foal from a 6-time winning & Group class mare. Bred on same nick as European champion SEA THE STARS (DANZIG line over MR PROSPECTOR line) & to CRIMSON SAINT rasmussen - Australia's top sprinter & 5-time Group 1 winner SANTA ANA LANE is also bred this way. Plenty of scope in the pedigree with winners up to 3300m as well as the blood of once-in-a-lifetime horses like FASTNET ROCK, RUBITON & REDZEL. EL ROCA (AUS) (Bay 2010-Stud 2015). Top on the 2013-14 NZ 3YO Free H (1200m-1600m). 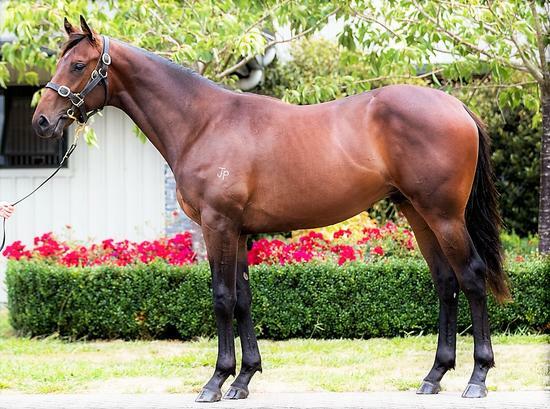 3 wins at 1000m, 1200m, NZ$35,625, A$385,000, ATC Eskimo Prince S., L, Whangarei RC Westbury Stud Challenge S., L, 2d ATC Randwick Guineas, Gr.1, Liverpool City Cup, Gr.3, 3d ATC George Ryder S., Gr.1. Out of a sister to SW Millrich (STC Sweet Embrace S., Gr.3). Sire of SP Bella Mente, Moeraki and of First Rock and of the placegetters Why Big Bry, etc. His oldest progeny are 2YOs. Flower Bomb, by One Cool Cat. 6 wins to 1300m, NZ$109,960, ARC Service Foods H., Tip Top H., Waikato RC Lodge City Rentals H., 2d ARC VRC Trophy, More FM H., Scot Thrust H., Cambridge JC AON Presland Tocker H., 3d ARC Westbury Classic, Gr.3, JRA Trophy H., BOP RC BDO Tauranga Exceptional Client Service H., Taumarunui RC Modern Transport Engineering H., Whangarei RC United Security Northland H. This is her first foal. Flower Bomb (One Cool Cat). 6 wins. See above. Tamreen (Bahhare). 2 wins at 2400m, 3300m in GB and France, Longchamp Prix de Clichy, 2d Lyon-Parilly La Coupe des Trois Ans, L, Deauville Prix de Pont Audemer, 3d Longchamp Prix du Pavillon, Deauville Prix Beachcomber Hotel Le Victoria, 4th Bordeaux Grand Prix Inter-Regional des 3 Ans, L.
Aqwaal. 3 wins-1 at 2-at 1m, 1¼m, Sandown Bet365.com H., Newbury London Gold Cup, Goodwood Card Room 2YO S.
Hay Cal. 2 wins at 1200m in Aust. Zeditave Rose. Winner at 1400m in NZ. Wa-Naam. Winner at 8½f in GB. Hishmah. Winner at 1m in GB. Producer. Certavi. 4 wins from 10¼f to 1½m, Newmarket Chassis Cab Daf H., 3d Epsom Medical Jump Jockeys Derby H.
The Quiet Choisir. Winner at 2, Rome Premio Madelia, 3d Rome Premio Dedalo. Summer's Skye. 2 wins at 1700m, 2000m to 2018-19, 2d Perth Racing Vernon Orr 70th Birthday H., PSC Insurance H., 4th WATC Natasha S., L.
Sariel (King Kamehameha). 4 wins-1 at 2-at 1200m, 76,283,000¥, Nakayama Aqualine S., 3d Chukyo Chunichi Sports Sho Falcon S., Gr.3. Fast Rock. 5 wins at 1800m, 2000m, 84,716,000¥, Nakayama Hatsufuji S., Tokyo Fuchu S.
Lago Lida. 3 wins at 1200m, 1400m, R285,950, Turffontein BMS H., 3d Turffontein Mrs DB Hollis-Martin H.
Dreams of Platinum (Dream Ahead). Winner at 1100m in 2017-18, 3d WRC Wellesley S., L, 4th Wanganui JC O'Learys S., L.
Astino (Catcher in the Rye). Winner at 1100m in Argentina, 2d La Plata Clasico Luis Maria Doyhenard, Gr.3, Clasico Jose M Boquin, L.
Old Deuteronomy (Storm Cat). 3 wins-1 at 2-from 6f to 8½f in GB and U.S.A, Newmarket 2YO S., 2d Curragh Phoenix S., Gr.1. Sire. Steam Cuisine (Mark of Esteem). 4 wins-2 at 2-at 7f, 1m, Newbury Fillies' H., 3d Ascot October S., L. Producer. Emperor Ajeez. 11 wins-1 at 2-from 1300m to 1600m in Poland, Warsaw Nagroda Mosznej-twice.